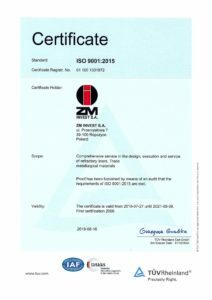 To meet the requirements of our current customers and to attract the new one as well as to develop our company, we implement the Quality Management System ISO 9001:2015. In its main aims ZM Invest S.A. has taking care of the high quality of services and their complexity. With the close cooperation with the final customers it leads to the technological processes and production costs optimization thereby give satisfaction from the used refractories.It is possible through the continuous observation and market analysis , as well as continuous process improvement concerning the quality principles. 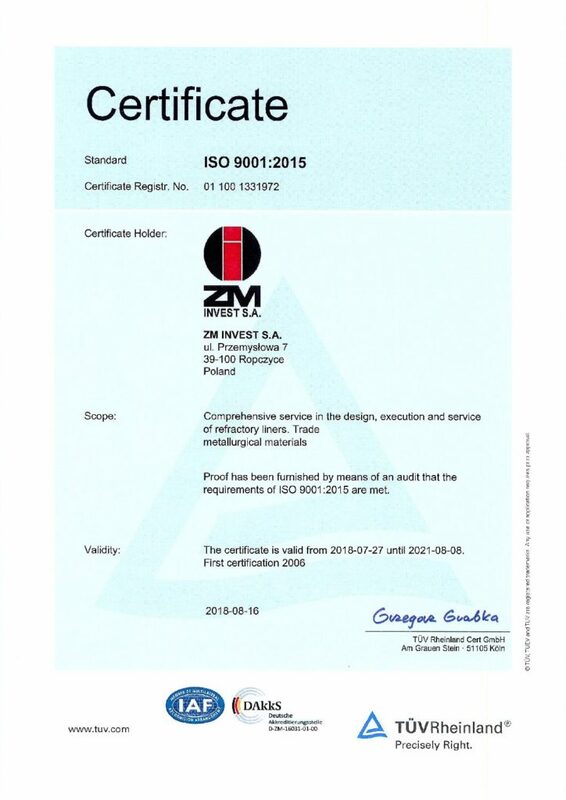 ZM Invest S.A. focused on the efficient work of the Quality Management System to assure our customers that all delivered products and services are not the result of the coincidence , but were controlled by the effective quality methods. The implemented System required from our company more than just creating the procedures of the quality assurance. It means the necessity to fulfil the gap in the quality culture, which will create the atmosphere of the open cooperation between the employees, suppliers and customers. Because of that the Quality Management System is not the finished process but it still needs the continuous improvements by better conformance to the specific demands and requirements of the market.